“Sonia Nassery Cole knew that shooting a movie on location in Afghanistan could get her killed. 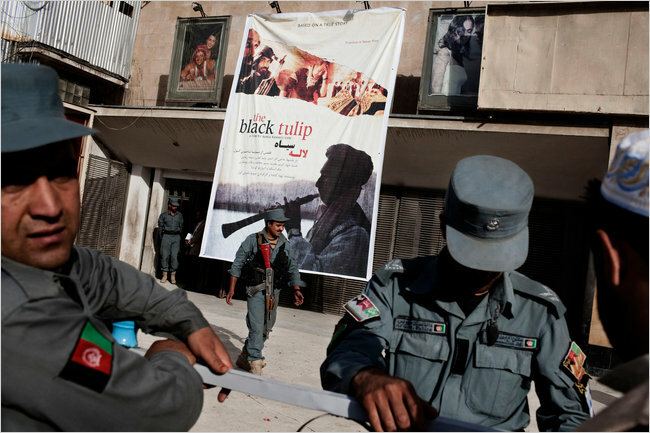 The most vivid reminder came a few weeks before filming, she said, when militants located her leading actress and cut off both of her feet,” says a New York Times article about a new film on Afghanistan, The Black Tulip, that just premiered in Kabul. The bit about the amputation in this opening paragraph has gotten Ms. Cole, an Afghan born activist/director/actor who grew up in the US, in trouble. Questions about the legitimacy of her project and the intentions behind it are spiraling. Rod Nordland had a beautiful follow-up piece in today’s times titled “Snickers and Skepticism Greet Premiere of Afghan Film.” He portrayed the local’s reaction to the film and raised more questions about the project. It was meant to be a serious film about Afghanistan, by an Afghan-born director, set in present-day Kabul and even filmed on location here, but many of the Afghans who saw it said they did not recognize the society they knew.The movie tells the story of an Afghan woman who starts a family-run Bohemian cafe in Kabul, where they serve wine in teapots and have poetry readings, which angers the Taliban. It is shady because Ms. Cole refuses to offer details on the actress, brushing the issue aside by saying “the woman begged her to leave her alone for her own safety.” And its shady because one of her strongest supporters on the ground, the head of Afghan Film, Eng. Latif Ahmadi, told the New York Times he did not believe in the story. “I think that’s just propaganda for the film,” Mr. Ahmadi said. It seems even shadier because many in the local film industry, including Mr. Ahmadi who helped in casting the movie, told the New York Times they had never heard of an actress named Zarifa Jahon. And they have not heard of an actress who was amputated. This whole episode makes one question: how much of this project is simply shameless self-promotion? There is nothing wrong with self-promotion– unless you make up blatant lies that defame and harm a people. I am no semi-loyalist here. I have no word of defense for the Taliban and I know they do horrible acts such as the one Ms. Cole claims. But something about Ms. Cole’s narrative sounds fishy. It just doesn’t add up. Maybe I am a cynic. And I would love to be proven wrong, but for now this seems to me another episode of taking advantage only for the purpose of generating publicity. This entry was posted on Friday, September 24th, 2010 at 5:03 pm	and tagged with Afghanistan, Black Tulip, Los Angeles, Movie, New York Times, Sonia Nassery Cole, War and posted in News and Politics. You can follow any responses to this entry through the RSS 2.0 feed. « Election Coverage: Why the Negativity, NYT? i hear you. one more episode in a long series. fishy character developments for foreign consumption is a major trade here. Yep, I feel the same way and blogged about this too!